It’s week 5 of the One Room Challenge and the end is in sight. 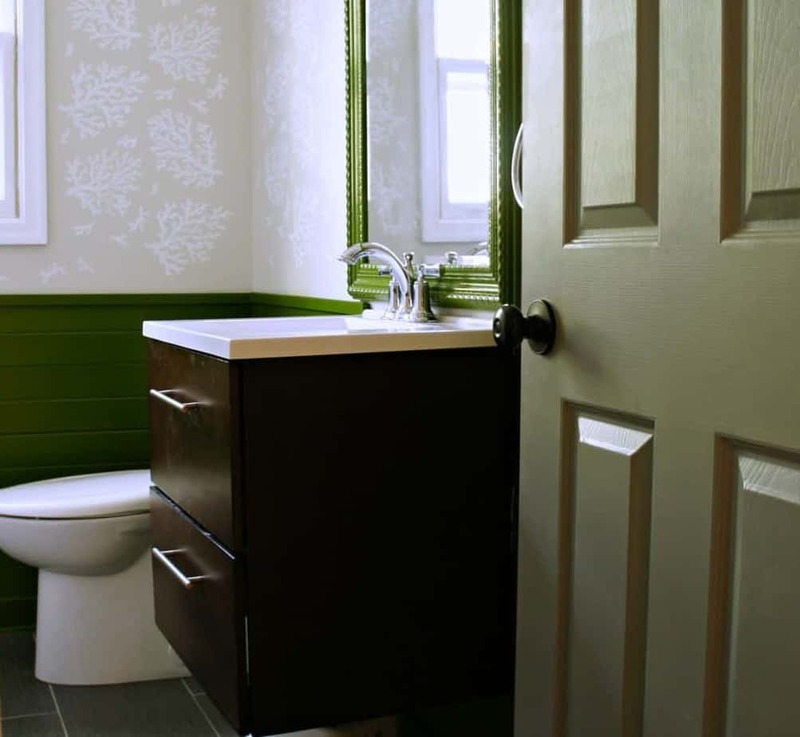 I’ve been revamping my main floor bathroom and it’s almost done. The final items came in the mail today and just need to be installed. 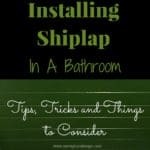 I’m ready for this bathroom to be done so that I can relax work on another bathroom. Haha! This week my husband helped me install the industrial pipe shelves that I love so much. I feel like there are certain DIY projects that I must do to get out of my system and pipe shelves was one of those. They were pretty easy to assemble, but I was surprised at the cost. If you go to pay and feel bad about spending so much on a shelf, check out these from Anthropologie! 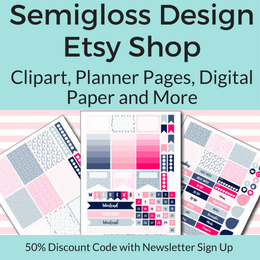 You just saved yourself a lot of cash! It’s all about perspective! We changed the design a bit, to be ya know, functional. I mean, I know we all have jars of water with dead flowers in them to display, but I also need a place for towels. Except, now there’s pipe shelves installed. Let’s get to that fun project. When you take the pipe pieces out of the packages, they are greasy and gross! Run a sink full of soapy water and wash each piece. Some have more grease than others and will need more soap to remove the grease. I like Dawn because it really does cut grease. Rinse and let dry. 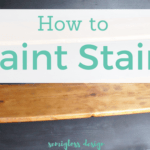 While the spray paint is drying, cut your wood to length and stain it. 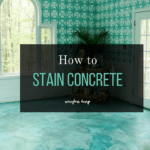 I used a combination of stains to get a pretty color. This was my trick to avoid going to the store. There’s a lot of that from me, lately. When the pipes are dry, assemble the brackets into L pieces. Leave a flange off of each bracket (it’s easier to just install the flanges first and then screw the rest of it on). This part was so easy that I had my son do it. He finished in less than 5 minutes. 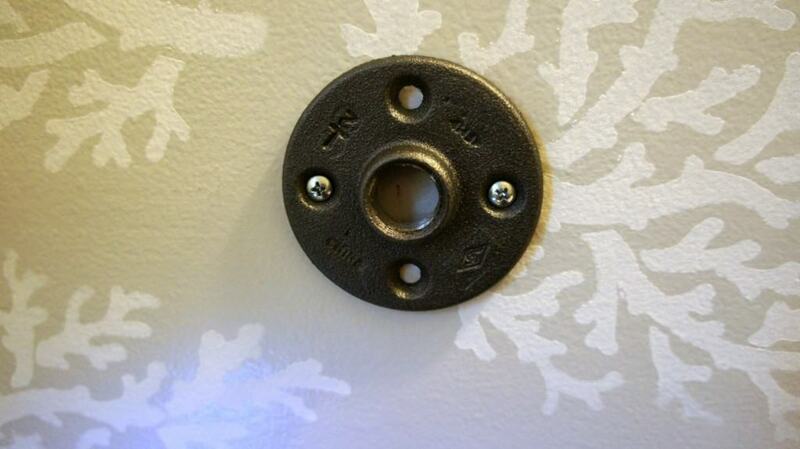 Use the stud finder to see if there are studs where you want to place your brackets. My wall had none in convenient places, so we needed anchors. 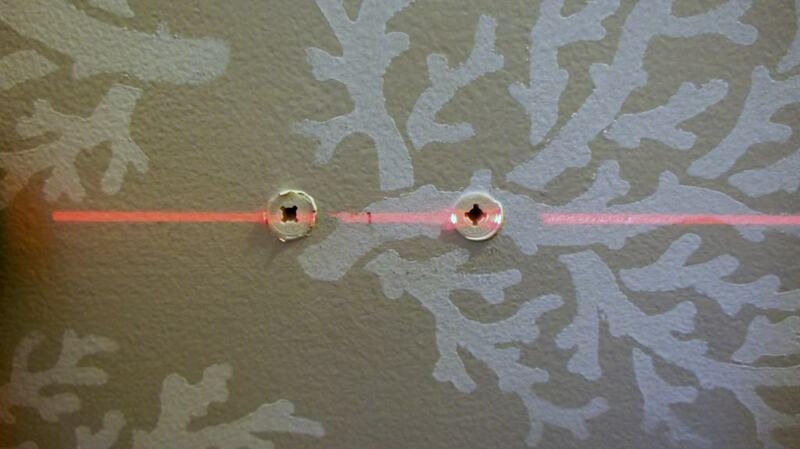 We used a laser level and lined up a flange on the wall. We marked where the holes needed to go and installed the anchors. These are so easy. You hammer them in a tiny bit and then use a drill to screw them in the rest of the way. No pre-drilling needed! We only used 2 anchors per bracket and chose to install them on the horizontal axis of the flange to distribute the weight evenly. 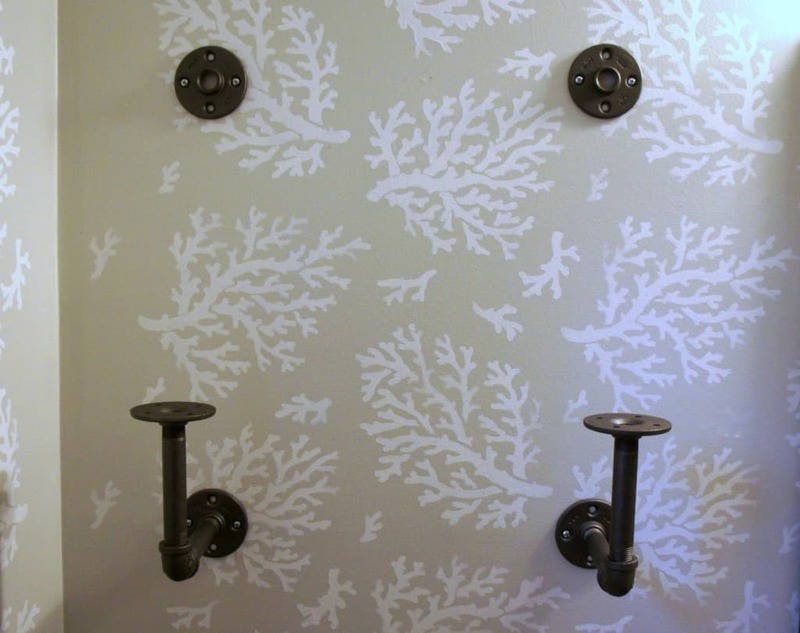 Then we replaced the flange on the wall and screwed it into the wall with the anchors. We repeated steps 6 and 7 until all of the anchors and flanges were installed. Then we installed the bracket parts. Note! Be sure to leave enough room between the wall and the bracket for maneuvering the bracket. Luckily there are so many pieces that you have plenty of room for error. If you install 2 shelves, make sure that you leave plenty of space between each shelf. We left 12″ between the wood on the bottom shelf and where the brackets begin for the top shelf. This gave us almost 18 inches of space between the industrial pipe shelves. It seems like a lot, but it will nice to have a plenty of room. 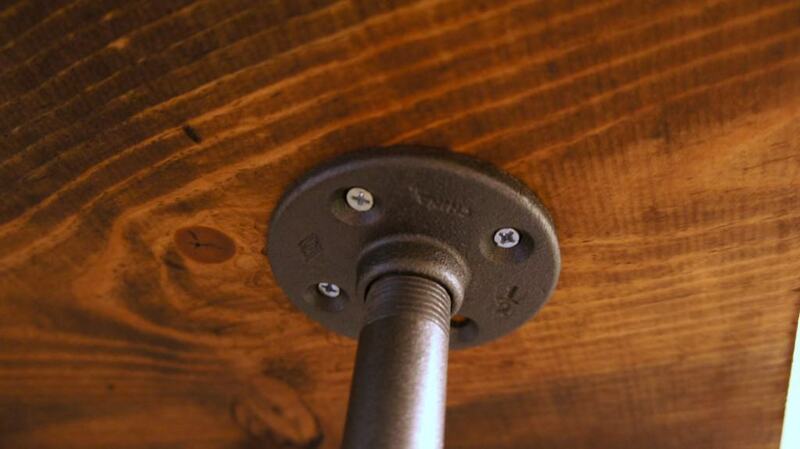 Place the shelf on the brackets and screw it into place, using short screws so that it doesn’t puncture the wood. Ta da! 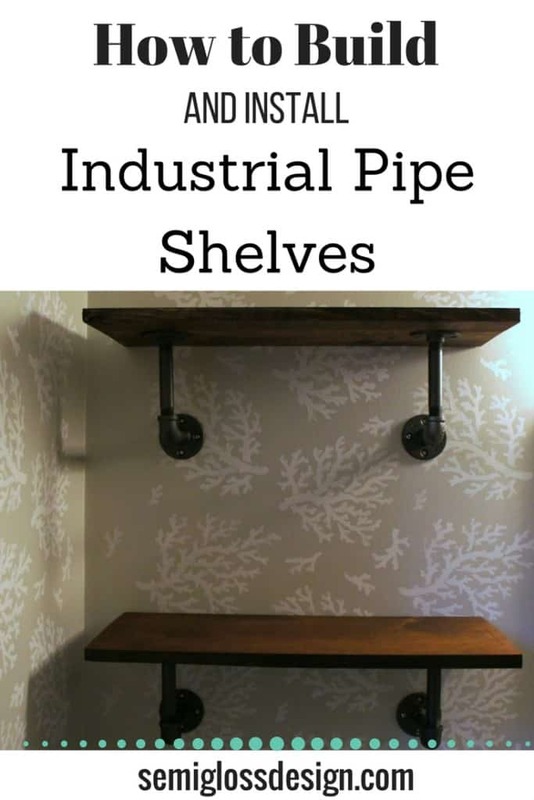 You have amazing industrial pipe shelves! 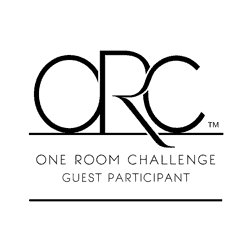 Be sure to check out the One Room Challenge participants and the 200+ linking participants! It’s starting to get so good! I can’t wait for next week!! Follow along on instagram for behind the scene sneak peeks! And occasional fall foliage pictures. they look awesome! we have some pipe built ins in our living room and i still love them! 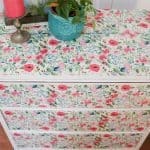 they are functional and relatively easy to diy. Thanks Cassie! I’m pretty happy with them. They add a lot of warmth to the room. Plus my steampunk kid is super into them. Parenting win! 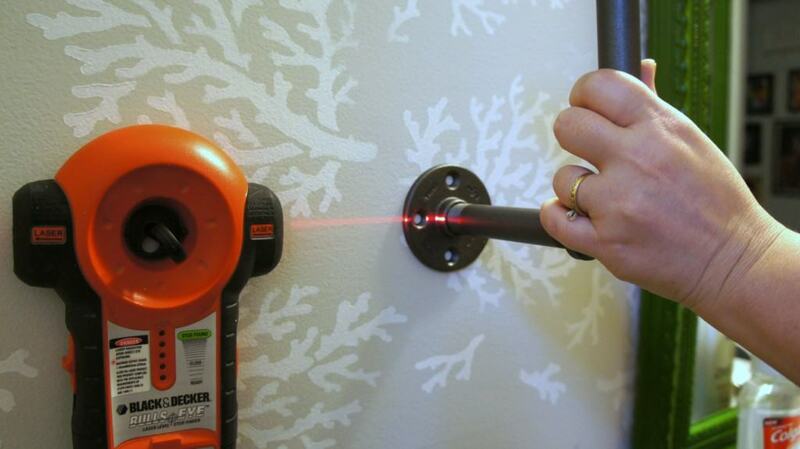 Great job on these–a laser level makes life so much easier, doesn’t it? Thanks Brittany! I love our laser level! oh I love how the shelves turned out! The piping looks great. Can’t wait to see the full reveal! Love the industrial pipe shelving! It looks great in your space! That laser leveler must be so handy. I need one! Those shelves came out so perfect! Very thorough and clear instructions too. Love your mood board. Can’t wait to see full reveal next week! Thanks Tee! The laser level is pretty handy. It’s a stud finder too, but my husband just bought one that also detects electrical wires. I can’t wait until next week either! So excited to see that you used the plumbing fixtures, we put the same ones up in my laundry room, Great job, look forward to the finale. I noticed Maria! Twin shelves! I love them so much! 🙂 I’m looking forward to seeing your lovely laundry room! 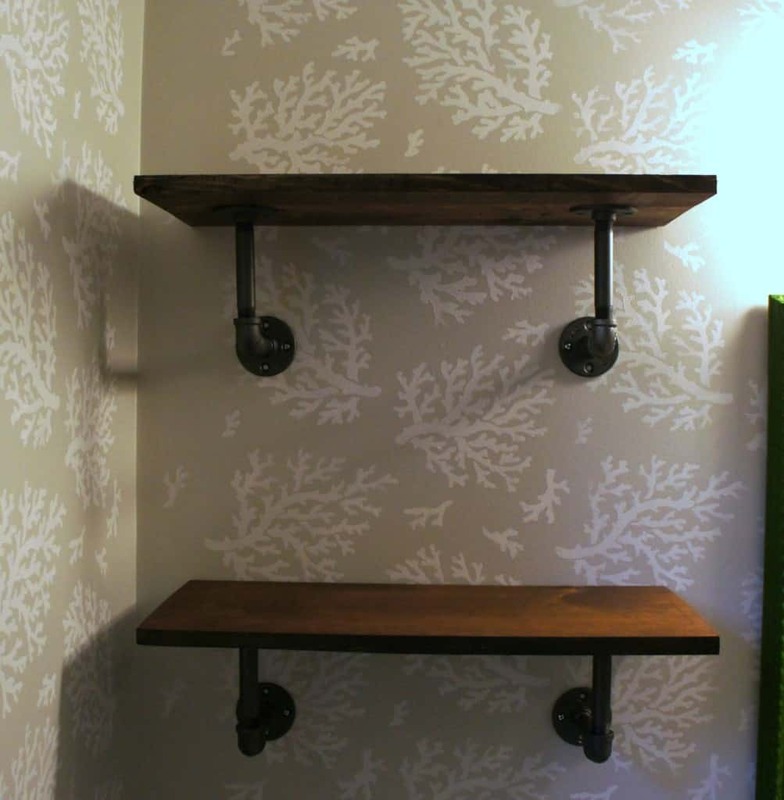 Your industrial pipe shelves looks fabulous! We were thinking of building a large industrial bookcase a while back and gave up the idea when we figured it would cost way too much. But a smaller project like yours, would be very doable! Looking forward to seeing the reveal next week. Hi Emy, your bathroom is really coming along. Love the shelves and your stencilled wall. Are you ready for the big reveal next week? I am excited to see how your room looks. Those shelves look amazing! 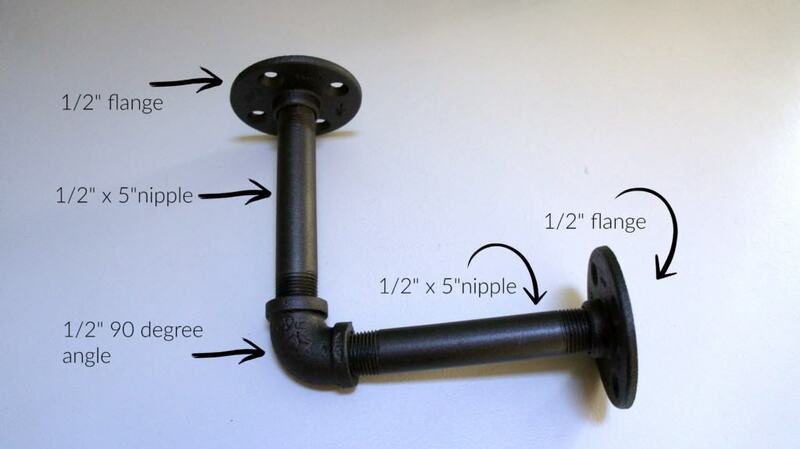 I paid close attention because we are building our industrial pipe hand rail this weekend, so this was very helpful. Can’t wait to see the final reveal next week!!! Wow! Those shelves are amazing! Everything is coming together beautifully! Love the pipe – it looks so good!! Those shelves look fantastic Emy! Can’t wait to see the finished bathroom!!! The shelves turned out so good! Can’t wait to see the finished bathroom!